Bringing together the leading authors currently working at the intersection of social science and transport science, this volume provides a companion to the well-established and extensive international Transport and Society series. Each chapter, and the volume as a whole, offers closer and richer consideration of the issues, practices and structures of multiple mobilities which shape the current world but which have typically been overlooked or minimised. What this approach seeks to do is not only draw attention to many new areas of research and investigation relating to mobile lives, but also to point to new theories and methods by which such lives have to be researched and examined. Such new theories and methods are relevant both to rethinking 'transport' studies as such but are also recasting 'societal' studies as 'transport' so that it comes out of the ghetto and enters mainstream social science. 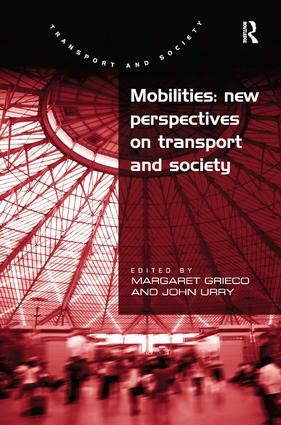 Contents: Introduction: introducing the mobilities turn, Margaret Grieco and John Urry; Does mobility have a future?, John Urry; Mobility and transport disadvantage, Julian Hine; Structures of encounterability: space, place, paths and identities, Frances Hodgson; Perspectives on young people's daily mobility, transport and service access in sub-Saharan Africa, Gina Porter, Kate Hampshire, Albert Abane, Elsbeth Robson, Alister Munthali, Mac Mashiri, Augustine Tanle, Goodhope Maponya and Sipho Dube; Research on mobility and lifestyle - what are the results?, Konrad GÃ¶tz and Timo Ohnmacht; Egos' horizons and behind them: snowball sampling on personal leisure networks, Matthias Kowald and Kay W. Axhausen; Connected, computed, collective: smart mobilities, Monika BÃ¼scher, Paul Coulton, Christos Efstratiou, Hans Gellersen and Drew Hemment; Technology fix versus behaviour change, Glenn Lyons; The impact of differences in commuting duration on family travel and activity patterns in the London and Paris regions, Peter Jones, Roselle Thoreau, Marie-Helene Massot and Jean-Pierre Orfeuil; Transport and social exclusion: where are we now?, Karen Lucas; What we do while driving: towards the 'driverless car', Eric Laurier with Tim Dant; Configuring commuters' accessibility to multimedia mobile services: the case of Bluetooth 'augmented' advertising in the Paris Metro, C. Licoppe and C. Levallois-Barth; Young people, mobility and the environment: an integrative approach, Colin G. Pooley; Sustainable mobility and mobility justice: towards a twin transition, Mimi Sheller; Transport history, the usable past and the future of mobility, Colin Divall; Aviation and ethnicity: an under-investigated area, Fiona Rajé; Bridging the mobility gap: the role of ITS, John D. Nelson and Paulus T. Aditjandra; Epilogue: the mobility of the sick: perverse organisational premises in the transport arrangements of the contemporary National Health Service, Margaret Grieco; Index. Margaret Grieco is Professor of Transport and Society at Edinburgh Napier University and series editor of the Transport and Society series. John Urry is Distinguished Professor of Sociology at Lancaster University, UK.